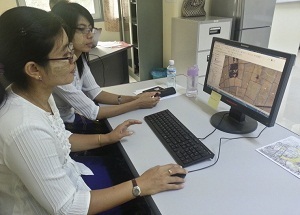 LAMP is assisting the Government to update Myanmar’s old cadastral system to meet the needs of the progressing nation. A prototype of a modern, simple and low cost digital cadastre system is being developed providing effective tools for cadastral map updating and maintenance of the digital cadastral data base. The cadastral system helps to protect security of tenure under the law and give greater confidence to the people. The cadastral system in Myanmar was developed during the last century as a graphical cadastre defining the size and position of land holdings on “Kwin Maps”. In total the farmland of Myanmar is covered by about 80,000 Kwin Maps at a scale of approximately 1:4,000 and the maps are held at the Township Offices. Most of the Kwin Maps are very old and in poor condition. Most maps are not up to date. Difficulties in updating the Kwin Maps and other land related records have led to inconsistencies in the cadastral records. The SLRD is leading the LAMP Project in addressing this problem. Appropriate new technology offers opportunity for a major leap in the method of keeping the cadastral maps up to date. Converting the graphical maps to digital form allows for easier updating and for multiple uses of the cadastral data. Existing cadastral records and map s are compared with the actual situation on ground using both high resolution satellite images and Geographic Information Systems (GIS). Changes can be detected and at the same time the boundaries can be corrected onto the new mapping system. 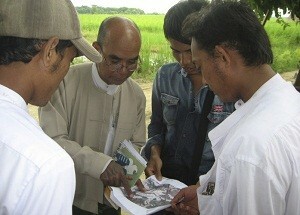 Field surveys are used to complete the process of updating the maps. All spatial data are kept in a Relational Database Management Systems which integrates the spatial data with the existing land records (textual and scanned images) on land rights, ownership of rights, land use and other data. In two pilot Townships, one in Lower Myanmar and one in Upper Myanmar, up to date, accurate and seamless spatial data have been generated based on the National Coordinate System. 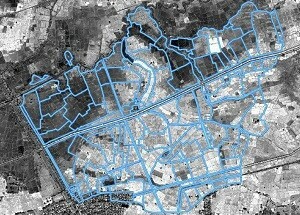 A system for updating and correcting existing land records has been implemented. A new cadastral map ping and map updating system is applied to the first 20 Kwin Maps. Maps were updated based on changes in the landscape such as new roads, new water canals and village encroachment. Also, changes in fields by the farmers and their sub-divisions were captured. Maps were able to be edge matched to avoid gaps and overlaps. Comprehensive training is given to enable staff to handle the new technologies and corresponding procedures. LAMP is creating a cost effective and simple but effective cadastral mapping system which will enable SLRD to fulfill its task better. The suitable application of modern technology and the creation of user friendly tools adapted to the exact needs in Myanmar will allow for a future rollout of the system on a nationwide level.